Of the sixteen Brahminical and Jain temples in Osian, it is most famous for the Jain temples. The main temple is also called as Osiyan temple. These temples are dedicated to Lord Mahavira. Jainism came to Osian in the 8th century. 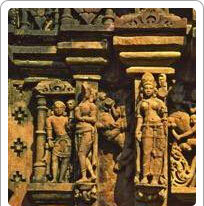 The main temple was built in 783 AD by the Pratihara King Vatsa Raja. This magnificent temple has withstood the ravages of time extremely well. Like the other Jain temples in Rajasthan, this temple as well as the other Jain temples of Osian, all have excellent architecture and beautiful carvings. Osian is an important pilgrimage centre for the Oswal Jain community who are so named after this place. A niche in Mahavira Temple contains sculpture of intertwined snakes that are worshipped by Oswal Jain, as Adhisthatyaka or Devtas. This is not really surprising the Jains here were originally of Naga extraction (snake worshipers) and snake worship has continued in parallel. Tourists can enjoy the beauty of the place of the place by taking a camel ride, which is particularly enjoyable at sunset. There are various camps and resorts that organise thematic performing arts and a choice of oriental cuisines arranged in the ethnic style.